I didn’t know that Tech has a memorabilia display in the Alumni House, but then I didn’t know about any Alumni House. Attached is a photo of a wall hanging I have and wonder if the university would be interested in this one for the display. It would be donated if there is real interest. On the back it states it was made in Germany. It is mint condition. At auction today, with the right attendance, it might draw several dollars; for insurance purposes maybe in the tens of dollars. I can offer later details on how I came across it. After receiving a BS from MCMT in Electrical Engineering in 1962, I stayed on to receive an MS from MTU in Nuclear Engineering in 1963. That makes me somewhat special (Mr. Rodgers told me I was special) in that I have a degrees from MCMT and MTU. In 1962 we were using book bags. Their use made a good impression on me that first week at tech. I thought that tech was a neat place – it didn’t matter how dorky they might look, the fact was they worked. I was certain they weren’t used at U of M or MSU but a tech we were there to learn engineering and what every might help to reach that goal was okay and their use didn’t need apology or explanation. After my wife, Mary, and I got married on December 27, 1962 she then came to live with me in a second story apartment at 203 Portage St. Our landlord was, Hank Swank, ran the laundry at the hospital. During our summer there, Hank tore down a house on the NW corner of Portage and E Houghton to provide parking space for his tenants. I worked with him on this project. In the house we found the wall hanging which he gave to me. 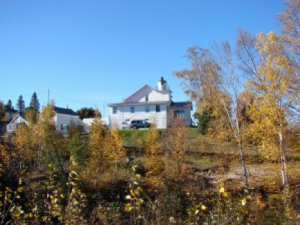 I live in Washington State now but every summer I drive (only on the blue roads) to my cabin on Drummond Island. About the book bags, everyone had them when I arrived at Tech in the Fall of 1962. The 5th year seniors too and theirs were well worn. Thus I feel safe saying that they must have been in use since at least the late 50s. Considering the heavy books we had to carry, the freezing temps and the frequent falls on the ice and snow, it is hard to imagine not having one. [I didn’t mention having to carry a slide rule in them, because they were generally attached to your belt not carried in your book bag although I imagine some were. Great newsletters! I keep sharing them with my grandsons [13 and 15] who are considering Tech. Great to see this note! I acquired the first of several in 1977 when I arrived at Tech as an Instructor of Archaeology and Anthropology. They were sold in the Bookstore, manufactured by Duluth Tent and Awning, now Duluth Pack. There is a great history at the Duluth Pack website (https://www.duluthpack.com/history). I always thought that they were made as geological sample bags, and were certainly used for that purpose, but it appears that they were designed in 1912 as shot bags, for carrying shotgun shells. The bag I am carrying these days was also designed for that purpose, but is a little different in shape; they call it the Mini Haversack. After eight years, it is showing some wear. I have worn out two or three of the original Shell bags, carrying all sorts of tools and stuff into the field doing archaeology and traveling around the world: the Caribbean, the Arctic, Australia, Europe, China, Japan, and all over the US. They have done the job for me, even after wearing through on the corners from projecting edges of clipboards and such, and being patched by Mr. Johnson, former owner of the shoe repair shop under the parking deck in Houghton. Yes, I still have my bookbag. Your comments are a little conservative, as the famous green canvas bag was widely used before the 60s and 70s. I came to Tech as a freshman in the fall of 1973 complete with a well used bag. It was my father’s that he used as a EE from 1949 to 1953. It served me well during that first year, after which I continued the tradition and purchased a new one. It saw continuous use until my graduation (CE) in 1977. Today that bookbag still gets used. As a collector car and restoration hobbiest, I take it to swap meets and car shows often. It’s great for holding parts and literature. I still have my old book bag. I converted it long ago to a fishing equipment bag, in which I carry an extra reel, fishing line, and assorted lure boxes. When I go brook trout fishing I put my fly lures and associated equipment in the book bag. When I go fly fishing, I switch out the fly gear for the spinning stuff in my vest. It is also used to augment and replenish my fishing vest. It also brings back memories. I still have my book bag, acquired new from the Tech Bookstore in the fall of 1961. I know they were common earlier; my cousin who attended Tech in the 1950s had one. Yes, I still have my Tech book bag. Used it in the 1960s. Everyone used book bags then. I think you will find that the Tech book bags were in use much earlier than the 70s. One of the first items I bought at the bookstore as a freshman in 1956 was a book bag. As I recall , most students had them. Like slide rules hanging from your belt, they were considered essential equipment. I left mine at home when I reported for active duty with The Corp Of Engineers after graduation and never saw it again as I spent 3 ½ years in France before returning home. The bookbag was at Tech long before the ’70s. When I arrived in the fall of 1964, that was one of the first things I purchased at the book store. Everyone had one. I used to pack that thing so full I could hardly carry it but it saved me from having top make return trips to the dorm. These were the days before backpacks where the thing. And yes, I still have mine! I still have my green Tech bag which I still use for hunting, fishing, etc. 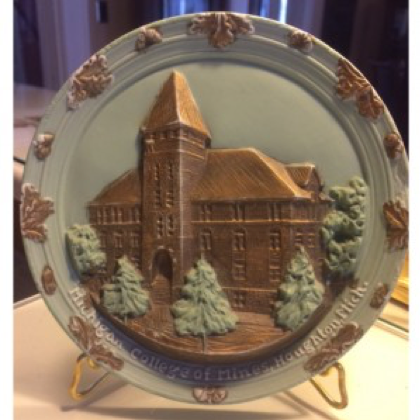 I bought it at the Union in 1963. Saw the newsletter story about the “iconic” Tech bookbag. Here is a picture of one I still have in my closet. It was the second one I used at Tech (’69 to ’73) after I wore the first one out. I agree with the “iconic” label. After I graduated, as a ham radio enthusiast, I found it handy for carrying purchases while I walked around local “Hamfest” flea markets. More than once, someone would stop me and ask if I had gone to Tech. I have looked for a replacement bag, but all the ones available from Duluth Bags are a lot fancier and priced likewise. I would think there would be an interest in that basic bag from Tech Memorabilia store. Book bags go back at least to the 1950s. It was amazing what you could cram into them. I remember students carrying them with a T-square sticking out. In the 1970s I used two of them as saddle bags on my snowmobile. Great for carrying a couple six packs! I still have one that I use to carry tools around in. I no longer have my book bag, but I can tell you first hand that it was very common in the 1960 to 1964 period (and probably the remainder of the 60s), not just in the 70s and 80s. Those book bags were very popular in 1964 and 1965 when I was at Michigan Tech. I no longer have mine. I assume that backpacks put an end to the Michigan Tech book bags – but have always wondered. Yes I do still have my old “TOOT” Bag, but it finally died of old age and much use as a rock collecting bag both at Tech and after I graduated. Note: I still have not given the remains an appropriate burial because I just cannot seem to part with it. I found it so good for rocks and light enough that I tried to purchase new ones but I believe they finally stopped making this type. Alas “The back pack” has taken over. However being a Tech engineering grad I made some modifications and found a local firm that used what was left of my “poor old bag” as a pattern and made me several new ones. I had to use white canvas rather than the original Tech green and the leather strap and closure was replaced with nylon webbing material. I also added a wider shoulder pad. Boy I would have really loved that when I was going to Tech toting all those heavy text books. That was not adopted on January 1, 1964 (by a quirk of the board) and became MTU shortly thereafter. Purchased my book bag in 1957. Still have mine that I got as an incoming freshman in 1964 (last class for freshman beanies and other hazing traditions). Slide rule and drafting tools are long gone, however. My book bag is still filled with photo negatives from my years there. I looked for my 1959 book bag but apparently has been discarded. I remember a small hole burned by acid in chemistry lab. The only things I have left are my slide rule, diploma, and many many good memories. Who could forget 8 AM math class at -20 and 6 inches new snow. 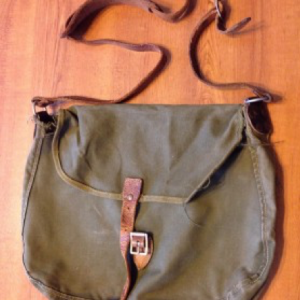 I attended Tech from ‘67 to ‘71 and my green canvas book bag was almost a permanent fixture of mine. Living off campus, it was about the only good way to take a days worth of books with me, particularly when I lived in the Nutini cottage 6 miles out of Hancock. Alas, mine wore out with the canvas giving out shortly after graduation. The bag knew its service was done. Those book bags go back into the 1960s. I used my brother’s bag when I finished my last two years at Tech 1975-1977. His was lighter green and well-worn. He graduated from Tech in 1968. I still have my bookbag, however mine doesn’t look as good as Dave’s. It has a few faded addresses written on it, barely can read Wadsworth Hall, 717 Ryan St and 202 Franklin St. A seam or two are coming apart, it’s faded and the leather has seen much better days. I have almost tossed it out a few times, however it was with me through Doc Berry, Prof Tidwell, snowstorms and a few fender benders. So it remains on a closet shelf next to my everyday duffle bags and the baseball caps I can’t seem to part with either. This type of bookbag was widely used on the Tech campus in the 1950s and 1960s accompanied by the big leather-cased slide rule ! The green book bag was quite prevalent when I was at Tech 1966-70. And I still have mine. I still have my book bag. And it was used in the late 50’s and early 60’s. I graduated in “61”. In fact, I have two of them. The one that served me at Tech was in pretty bad shape, so when we went up for a Winter Carnival a few years after I graduated, I bought a new one. I use it when I go out hunting for turkeys in the spring and deer in the fall. I also use it in the summer when we go to tractor shows to carry when browsing in the sales area to carry small stuff I just have to have. So it is still serving me well. Yes I still have my canvas bag. It is worn but still worthy. It carried all my books while at Tech and even served as my laptop case for awhile while I was consulting several years after graduation. Oh yeah! I still have my Tech book bag which I used at Tech from 1961-65. Lots of good memories with it. I still use the bag regularly to carry mail in as our house is 300 yards from the mailbox. I was fortunate to be at Tech when we won our first 2 NCAA hockey championships. Now that was fun! I got mine in 1971 or 1972, since graduating it had been full of softballs and hardballs hanging in my garage. Not quite what was carried in it during my school years. Yes! Probably Circa 1973, the first, 1971 wore out. It is still in good shape and my wife uses it from time to time. It held all that we needed. Today everyone has a backpack from age 6, the laptop, iPad, kindle, phone, chargers, calculators, water bottles, etc., probably wouldn’t fit today and there is no padding. It was a great thing. Everyone had one. Book bags – remember them well – my shoulder remembers them too! Both my husband Tom’s and mine fell apart many years ago. Even though they were built very rugged with heavy green denim type material, with a heavy leather strap, they didn’t last forever. I went through 2 during my 4 years. They were used way before the 70s. I got my first one the Fall of 1967 and Tom got his the Fall of 1965. I’m sure they were used in the early 60s if not before. I think ours wore out faster because we used them as collection bags when we went agate picking!! The MTU Bookbag is older that you imply in your article! There were plenty of well-worn book bags around campus when I arrived in 1958. My guess is that they are a remnant of WWII, but I guess you will have to figure that out! I used a bookbag like the one you are showing when I went to Tech in 1954-55. Like many others, we discovered this one after bringing the next generation of Tech Toots up to God’s Country: Estivant Pines. Let the place encompass you. The time flies by. The serenity is palpable. 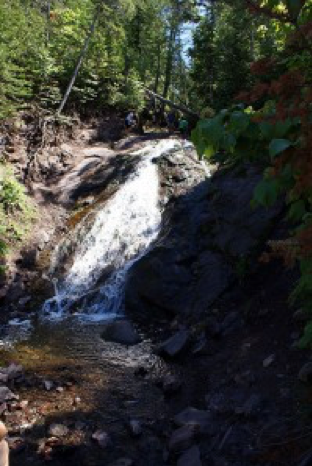 This June, for the third year running, my brother Steve George (ME ’98) and I have brought some of our older kids up there to ride the trails in the Keweenaw. We are just recreational riders and it’s as much about seeing the sights of the area and showing our kids how beautiful the peninsula is as it is about riding trails. 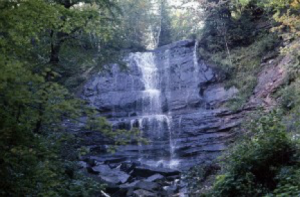 This year we might be able to go to the top of Douglass Houghton Falls, as we hear that is again public land. We no more than leave one year and we’re already looking forward to the next! Hi, Sarah. All the best to you and your family, on your move back to Tech. 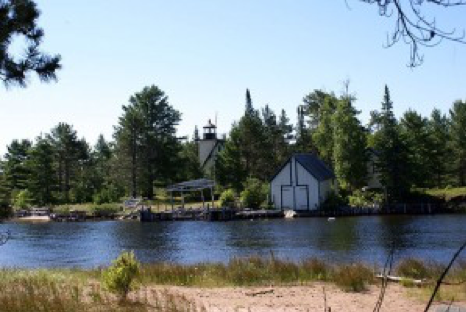 I was in graduate school, the summers of 1987 and 1988 (metallurgical engineering), and my parents vacationed both of those summers, in the Houghton area, so we could spend time together. On an almost daily basis, we would end up at McClain State Park, to – you guessed it – watch the sun set, over Lake Superior. Fond memories, to say the least, so my Copper Country favorite would have to be sunsets at McLain. McLain State Park has to top my list. 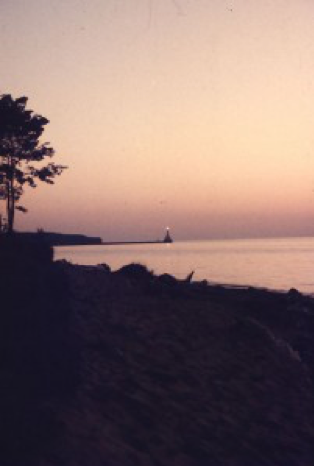 There was a time when you could drive onto the beach from the breakwater, which I did and nearly got stuck in the sand. It was a gathering place where beer and pasties were enjoyed, as well as a quiet place out of the way for contemplation and study. Had a burlap bag with a rope to shore to serve as our refrigerator and in what some may call foolish moments, Lake Superior was a place to swim. The most memorable time was a night before classes began in the fall, late September then, and when we put the fire out it was so dark we could not see to make our way through the woods to the parking lot. 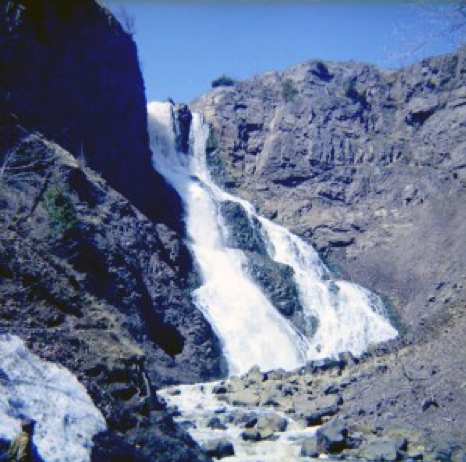 Douglass Houghton Falls – My brother was named after Douglass Houghton except it was with one “s” instead of two. Drive to Copper Harbor through the trees. 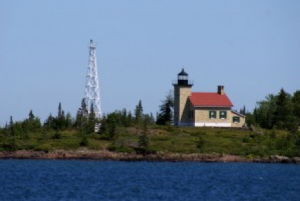 Isle Royale – I would go on the Ranger III for a week, but you can also go on the Isle Royale Queen for a day. I camped out there for a week with a canoe and a tent when I finished my sophomore year at Tech. 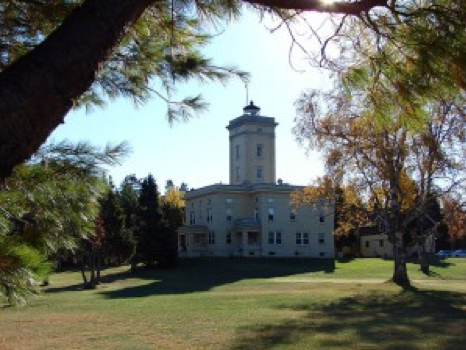 Bishop Baraga Shrine – It is a bit out of the way, but worth the stop. 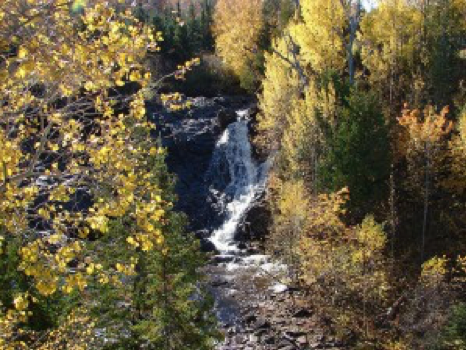 If you continue on the road going past Bare Bluff to the dead end you come to a trail on state land where you can hike on a trail (relatively easy walking and not to long) to Montreal Falls (favorite waterfall in the Keweenaw, road can be sketchy) which fall into Lake Superior. Follow the trail along the river to the upper falls too. Waterfall hunting, the Keweenaw has a lot of waterfalls with the fault line running up it. Hungarian falls was popular when I was in school but there are a ton more. A topo map is helpful. 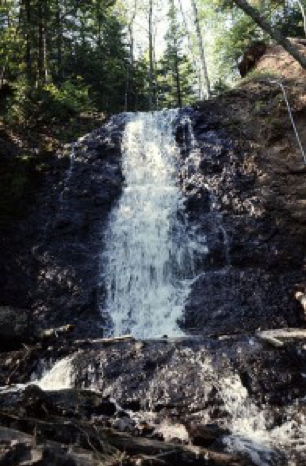 Any sharp elevation change with water should have falls. Some are small, others are large. All provide a great escape. Birding is great if you are into that. 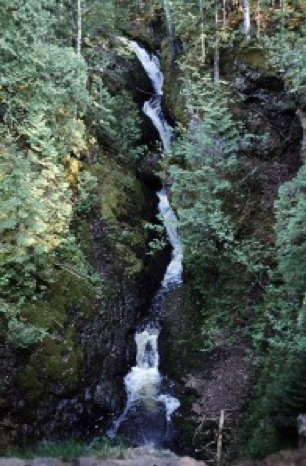 The peninsula actually has a bunch of boreal species that birders typically have to go to northern Minnesota or Canada to find. Seaman mineral museum is worth going to at least once even if you aren’t into rocks/minerals. I have so many good memories from exploring the Keweenaw. These are just a few of many adventures that made my time at Tech wonderful. Good luck with your bucket list! I can’t wait to read about other students spots/locations. I would like to nominate the Gay Bar in Gay. In the early 50s when bird hunting in that area we always stopped in for a beer and to catch up on the local gossip. A few years ago I was on a bicycle tour with a bunch of folks mainly from Lower Michigan and out of state. 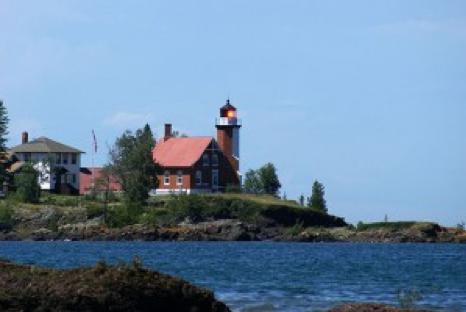 We started from Baraga and pedaled our way to Copper Harbor. Next we were scheduled to head down the south side of the peninsula to our camp site at the Lake Linden High School. I knew we would be passing through Gay even though it wasn’t on our route maps. And, of course I knew gay meant something different in my Tech days then it does now. So I was interested to see the reaction from the group as we came upon the Gay Bar sign. Sure enough they couldn’t pass it up. It was early in the day and a couple of locals were nodding over their beer at the bar when all these folks in brightly colored Lycra filed in. In a dark corner was an old dust-covered piano and one of the guys was an entertainer from Chicago and he quickly started banging out tunes that everyone knew and even the locals enjoyed the party. I am the former Janet Krenitsky, class of 1970. I am currently in Florida recovering from right knee replacement. One of my favorite things to do at this time of year in the Copper Country is to travel up the Keweenaw to Eagle River and see the deer come into feed in the park. The park is surrounded by cedar trees which is a food of the white tail anyway but local people have put down hay for them too. You get to see many white tail at one time. You can pull your car up close and watch. See all the fawns romp around. It is fun to guess which ones are female and which ones male. I was a varsity skier in my youth and loved Mt. Ripley. Now I think cross country skiing will be more my taste after I am recovered. 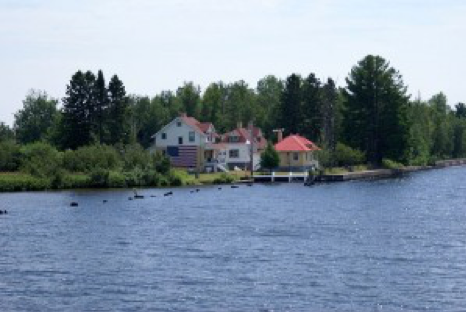 Enjoy the Copper Country. 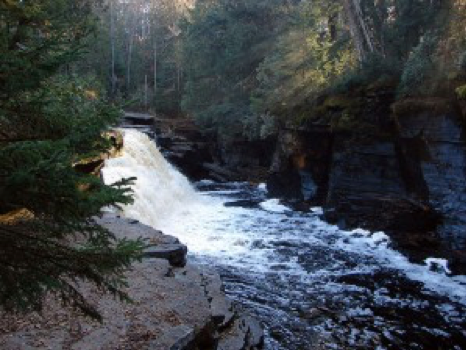 I saw some earlier pics on Facebook from the Eagle River falls during the melt. Wow what gushing and Jacob’s Falls by the Brothers of St. John Cathedral too. I will be returning in May to spend the warmer months at my home on the East side of Portage Lake. In the summer, go west to Misery Bay. It’s the only place relatively close by where the water in Lake Superior is bearable to swim in. The beach is worth the drive. First, welcome aboard, I’m sure you’ll enjoy the ride. Second, you asked about ideas for thing to see in the area. Well I would recommend the various waterfalls and lighthouses. Anyway, that should get you started. Cedar Beach off the end of Calumet Water Works Road. In the early 70s there was typically no one there and I could walk for hours searching for agates and prehnite. Alone. Peace and quiet. The Sturgeon River near Chassell. I had a canoe and would take a friend and launch at a small town park upriver and paddle down to the Hwy. 41 bridge near the bay. Again, peaceful, quiet, and rejuvenating. The Cliff mine dumps. We used potato rakes to rake through the material on the dumps, pulling it down from above us and finding “chisel chips” of pure native copper, carved out of the mine in the 1850s and 60s. We also found pieces of Meerschaum pipes left by the Cornish miners of the day. The Quincy Mine railroad grade. I rented bearpaws (snowshoes) and started from the Mine site on a mid-winter Saturday in 1972. I shoed down the railroad grade toward Dollar Bay – the route that copper ore would have taken from mine to mill. At one point I fell and literally had to swim to a small tree to pull myself upright again. he snow was so light and so deep I had nothing to push against to get stood up. Using a walking stick I found I was shoeing in 5+ feet of Copper Country powder. Totally awesome!! This is why it took me 5 years to leave Houghton. This and a cute ME-EM Masters candidate that captured my fancy.